Erin Blegen: My Scrap Cabin: My new blog debuts its first layout!! Good morning!! It sure has been a busy last few days here with my little housewarming party! Wow- the response has been so positive and supportive- I'm so very blessed to have so many amazing friends out there- thank-you SO MUCH to all of you who took the time to follow my new blog and leave me some kind words! I just want to say WELCOME to you all- old and new- and I'm so happy to be here :). 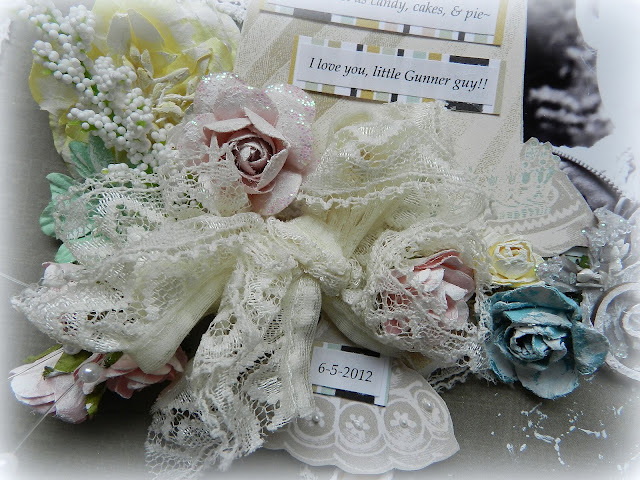 My little Gunner really is my little sweet cakes, lol. He's so adorable- I could just eat him up!! :D I love this photo of him- if he's not acting silly and showing off his cheesy smile, he's typically got this type of a serious expression on his face. But whether he's being serious or silly, I love him all the same :). And then I was encouraged to add the hand-stitched detail running diagonally through my page by the Fabulous Friday "Stitching" challenge over at Frosted Designs! I love the flourishes from Scrap FX. This one worked out perfectly to ground my title. 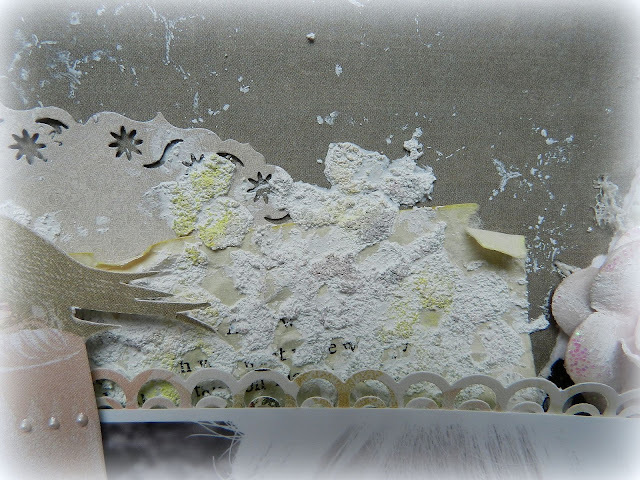 I used a 6x6 chicken wire template from The Crafter's Workshop to create this messy texture. I simply took my tub of Martha Stewart Texture Effect and a butter knife to spread it on over the mask. After drying, I dabbed some different color inks over it. I fussy cut this beautiful cake from one of the "In Love" papers, dressed it up with some liquid pearls and then used it as the focal point and main component of my large cluster. Thank-you all for stopping in and taking a peek. Remember, my giveaway runs through midnight on June 30th, so there's still plenty of time to share the love and spread the word! Another giveaway will be revealed at 200 followers :D! Good Morning, stranger. Weird that my phone has not rang yet!! This page is gorgeous, and although that collection is geared towards weddings, it works perfectly here! 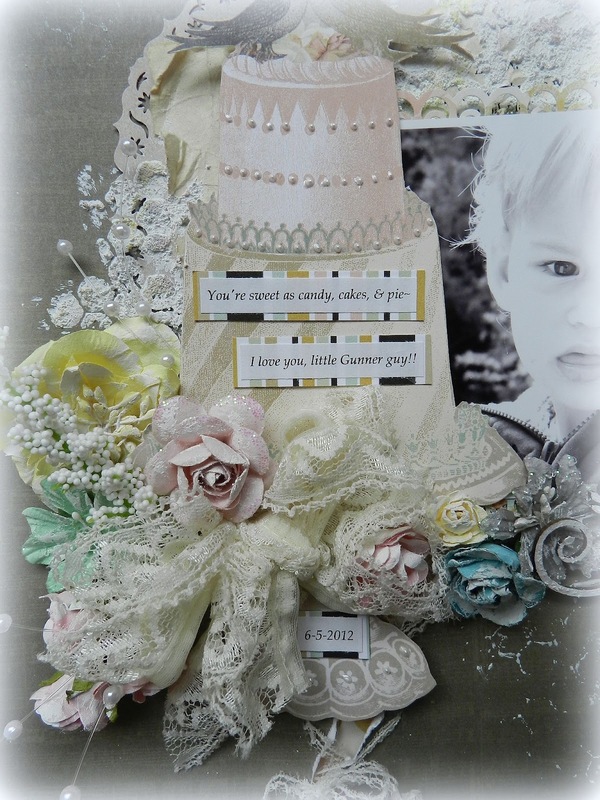 I really love all of the texture in this one..the lace, texture paste, everything, nicely done!! Congrats on your new blog, Erin....it looks beautiful! As I said on Inspire Me site your layout is stunning! Wow! That is just GORGEOUS!! Pure eye candy! Such a gorgeous page! Erin, your layout is simply gorgeous. I was visiting Melissa's site & she encouraged a visit to yours. So glad she did! Just became a follower. I love LOVE Webster's Pages and the way you've used these papers is divine. Your Gunner is a little cutie! Fabulous work. I've been waiting for this (not that your giveaway post isn't wonderful and all, but its your layouts I love looking at!). I love all of the little details you've added, its absolutley gorgeous! Awesome pg. Love the colors, the ppr and mix media. Gorgeous - love all the design elements - so much texture and detail! Beautiful, Erin!! I love how you made wedding papers fit this photo. I just love looking at all your different elements on every page...there is always something amazing peeking out from somewhere! I love the subtle hexagons. my goodness this is a gorgeous layout! and - I love your title and adorable picture too! Thanks for sharing with us at Frosted Designs! 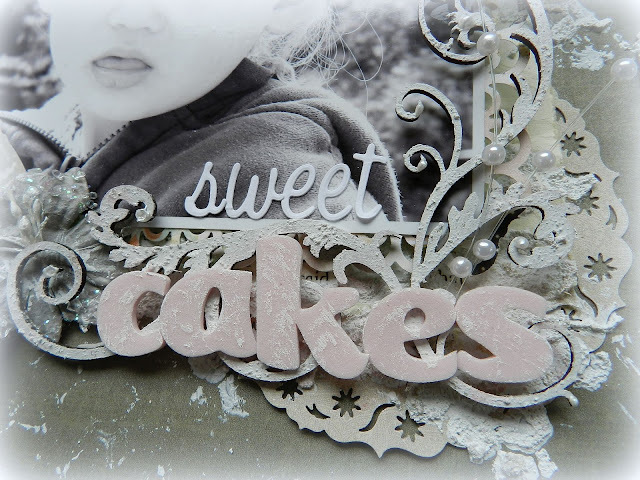 I love how you used the fussy cut cake on this page Erin, and it goes along perfectly with your title! And the technique you used with the chicken wire, is really awesome!! A gorgeous layout! Love the fussy cutting, flowers, and lace! Beautiful layout, I've been wanting that chicken wire template, love what you did with it! New follower here. Such a gorgeous LO! Love the chicken wire effect. Your layout is absolutely gorgeous!! 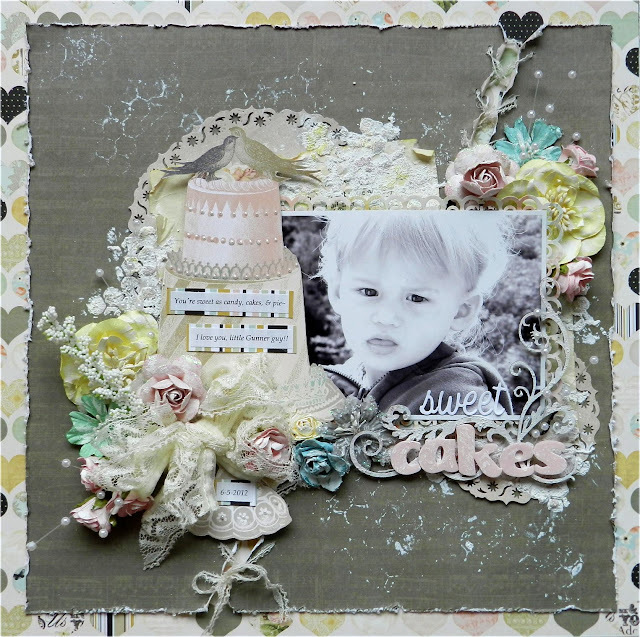 wonderful layout, love all your texture! thanks for playing along with us at Frosted Designs this week! Oh everything about this is so soft and pretty!! Really gorgeous! Gorgeous! You do such amazing work with layering, texture and little details. Love your take on fussy-cutting. Thanks for sharing your work with us at thinking*through*design! Such a beautiful, romantic layout Erin! I just love it! Oh wow! This is just beautiful! Love the cake and embellies building it up...all looks so gorgeous together! I love all the details on this. Gorgeous!! It's just gorgeous! I love the title, so sweet! And you are the Queen of fussy cutting! Thanks for sharing your thoughts on it.